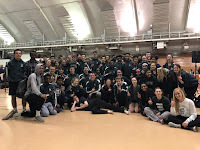 The Madison Memorial boys & girls Track & Field teams sent five of their brightest stars to UW-LaCrosse on Friday and Saturday to represent them against the best the state had to offer in the 2014 WIAA Division 1 State Championships. The weather for Friday's morning session was beautiful but the unpredictable weather of the Coulee Region in LaCrosse brought an over five hour storm delay for Saturday's finals. The Madison Memorial athletes were prepared and performed at a top level both days to end the season on a high note. The girls team just missed out on scoring (top 8 performances score) while the boys finished in 6th place totalling 30 points. Madison Memorial looks forward to bringing even more athletes back next season and continuing a proud tradition of success in track & field. Daurice F capped a storied Madison Memorial career on Saturday becoming the most decorated boys state track & field competitor in school history with his 3rd individual STATE CHAMPIONSHIP. (JMM athletes with 2 state championships include Dan Cautley, Charlton Hamer, Phil Downs, & Jester Weah). In the process of winning the 110m hurdles Daurice improved his SCHOOL RECORD time to 14.04 and broke a 33 year old STATE MEET RECORD. His time of 14.04 is the 2nd best time EVER run by a Wisconsin high school athlete and ranks as the 29th fastest time in the NATION by a high school athlete thus far this spring. In addition to his success in the 110m hurdles Daurice added two other STATE RUNNER-UP performances in the Long Jump and 300m Hurdles. His leap of 23' 5" in the long jump improved his SCHOOL RECORD. While his time of 38.25 was a personal record in moves him into the top 30 all-time in Wisconsin state history. Over Daurice's high school career he earned 3 state championships, 2 state runner-ups, & a 3rd place at the WIAA state meets. Kayla G competed in her first state track & field meet on Friday in the girls pole vault. Kayla made both 10'0 & 10'6 on her first attempts before the bar was raised to a new PR height of 11'0. Kayla didn't make 11' 0 but her 10' 6" clearance with no misses landed her in 10th place. Kayla's season best of 10'9" means she will be graduating from Madison Memorial as the 2nd best pole vaulter in school history. Sophomores Holly H and Sydney S competed in their first state championships and both handle the hype and stress of the state meet very admirably. Hopefully both gained valuable experience that will allow them to return in the future. Holly H threw the discus 118' 2" in the flights to earn a spot in the 10 person final. In finals she had a couple throws that could have moved her up that just landed out of bounds. Her throw of 118' 2" placed her in 9th place and has her ready to come back for more next season. In the high jump Sydney S cleared 4'10 on her first attempt and then also made 5'0" on her 3rd attempt. She was not quite able to make 5'2" (her PR) and settled for a 16th place finish. It was an extraordinary learning experience for Sydney who hopes to be back in high jump and maybe even more events next season.